– Mike Richards, buy out or not? See the cap cost (penalty) by year here. – How will the Slava Voynov situation play out this season? – What will Anze Kopitar’s extension end up costing GM Dean Lombardi? – Has Justin Williams played his last game with the Kings? – Evaluation of the Tanner Pearson contract. – Will Jarret Stoll be in the Kings lineup on opening night? 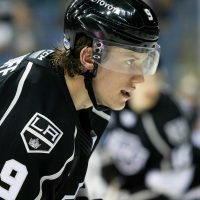 – Will Tyler Toffoli get a short or long-term extension? – Is Jordan Nolan getting traded? 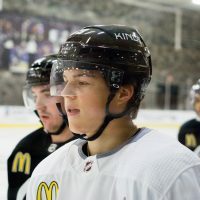 – Evaluation of the young defensemen, including: Jake Muzzin, Alec Martinez, and Brayden McNabb. – Will the Kings re-sign Andrej Sekera, and if so, how much will it cost? – Which prospects are you going to be hearing more about heading into training camp? 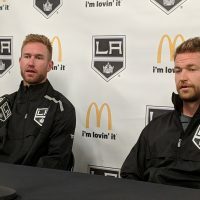 – Plus, thoughts on coach Darryl Sutter, Andy Andreoff, Jeff Carter, Derek Forbort, Matt Greene, Jamie McBain, Michael Mersch, Robyn Regehr, and many others. You can give this episode a listen using the player below or download any of our audio files for free on the MayorsManor iTunes page located here. John, can you also include a mini-review of the full prospect list for the next show you are doing with Andy? Sort of like a one-stop update in addition to the Calder run? Would love to hear abouth the Reign projections for next season. You also neglected to mention what will happen when we win McDavid on Saturday. That would really screw up Dean’s plans. He doesn’t have a box for him. Agree and don’t agree with Dennis and John. Yes, agree with Dennis that Voynov should be moved if his contract is not voided. Also move Greene and re-sign Sekera. Do not re-sign Stoll. Don’t let Sutter block the younger centers by using a player who can’t perform to previous levels. Sutter needs to be managed in that way. People say, “Stoll is great in the room, we need him.” The Kings did not make the playoffs this season partly because Stoll and the penalty kill declined. What positive difference does it make if Stoll stays one more year or leaves now? None. He will continue to decline as a player, Sutter will over use him, and he will be gone the following season anyway. Keeping Stoll makes no sense. 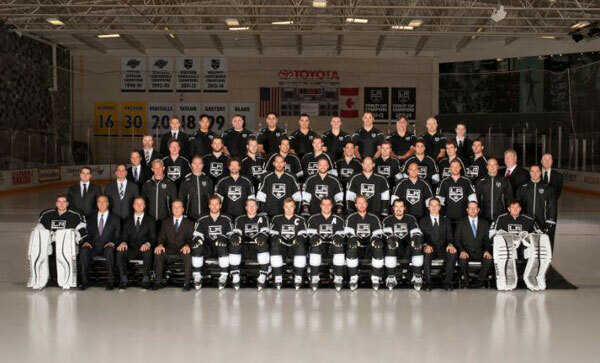 If the Kings can’t win without Stoll’s presence in the room, they have had it anyway. If DL pays Kopi ten million or more he will be sorry later. Offer him eight million on a take it or leave it deal. If he doesn’t re-sign for that amount, move him. Kopitar is primarily a defensive center who is good but will never be great offensively. You’re going to pay a guy who scored 16 goals, totaled 64 points in 79 games, and who was maybe your second best center this season ten million dollars?? This is a guy who played on the first PP all season with 64 points. Yes, he is very good but he’s not somebody like Ovechin or Bure (neither have Stanley Cups) but are P.T. Barnum players who put people in the seats, or even like a Toews or an Yzerman who are/were better players. Does DL think Kopi is going to be worth ten million a year at 33 or 34? He’s not really worth that now. The Kings are loaded with wingers and defensemen in the organization. There is depth in goal as long as Jones sticks around with the other guys drafted and developed. If DL had to move Kopi (and Voynov) he could get a lot for them. At least one really good young center. This is not a knock on Kopitar but he is an average skater speed-wise, won’t drive the net, is not Getzlaf-like tough and is really a defensive center with playmaking ability. I would like to see Kopi continue in a Kings uniform but not for ten million a year! @Crown Royal – Bravo! You got some hair on them peaches to call it like it is. Kopi’s next contract will be a rerun of the Brown situation if Dean doesn’t take his own “lesson learned” statement to heart. Fact is, Kopi has declined. Question is, will it be a trend next year. The wise move would be to let him have another year to prove what he is worth TODAY, and not pay him for what he was two seasons ago. Kopi made his millions early. Thanks! I suppose I see Brown a little differently than most people. To me Brown and Quick are the real core of the team. In 2012 if DB hadn’t played out of his mind down the stretch and well into the playoffs I don’t believe for a second the Kings would have won it all. Until Hanzal boarded Brown in the conference finals I think DB was hands down the Conn Smythe winner. 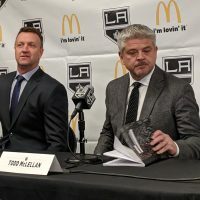 Quick stood on his head in the playoffs and it was really those two guys who were instrumental in bringing the first Cup to L.A., and set the team up for the second Cup which would not have been won without winning the first one. I agree with you DB is not playing up to his contract stat-wise but when people start saying that Greene and Stoll’s presence is essential to the Kings remaining a contender, I just don’t believe it. DB as the captain and JQ who is the best money goaltender in hockey is the direct line back to the first Cup. I continue to see Brown’s value to the team even without the numbers (he doesn’t get first PP time anymore) but I’m not going to pay a forward like Kopi ten million a year unless he can put some numbers up.